The Hawthorns station opened in 1995 on the 'new' Jewellery Line (or Great Western Railway as I have a feeling it was known) which involved relaying track from Snow Hill along the old GWR route, that had been removed in 1972, up to its link with the ex-GWR line to Kidderminster. 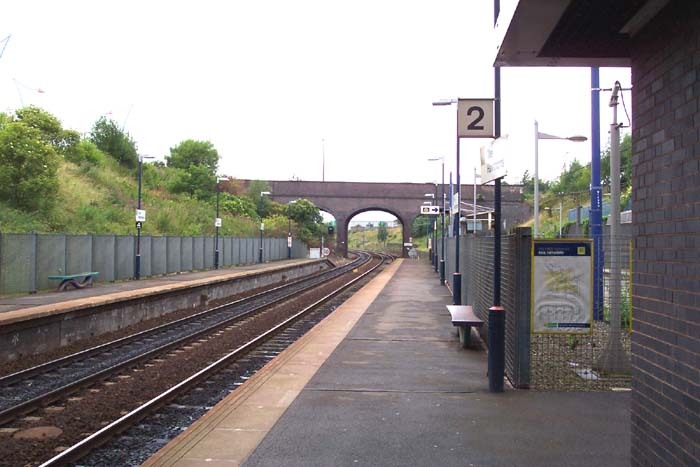 The station sits on part of the site once occupied by The Hawthorns Halt which itself was a late-comer to the region's rail scene, opening as it did under the GWR in 1931 on their line from Snow Hill to Wolverhampton Low Level. 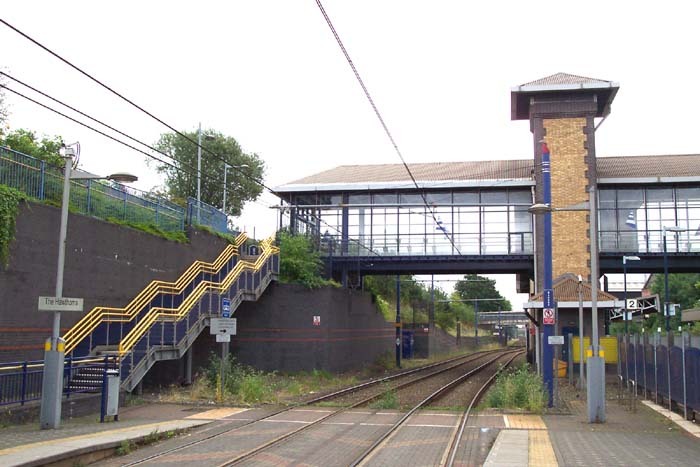 It served football specials for the adjacent West Bromwich Albion football ground (The Hawthorns) and as such was not deemed worthy of 'station' status but was comprised of three platforms: platform 3 catering for return travel to Stourbridge, with platforms 1 and 2 being sited the other side of Halfords Lane. 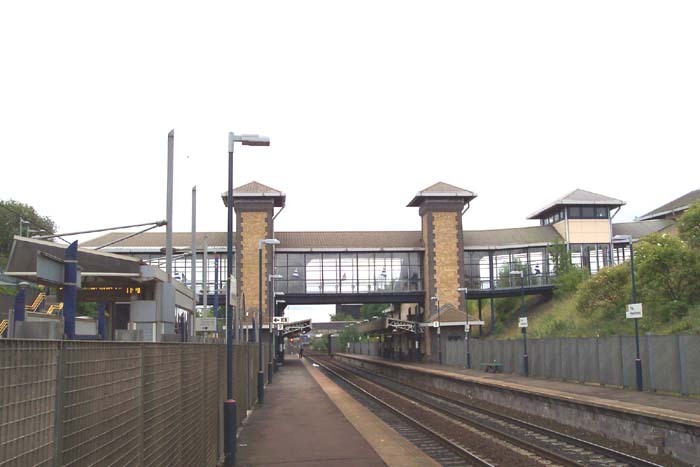 The halt closed in 1968 only to be redeveloped and spring to life again in 1995 as mentioned above, being further developed in 1999 when the Midland Metro opened. Above you could be fooled into thinking this was a shot of the entrance to a young offenders institution or some other 'at Her Majesty's pleasure' establishment but in actual fact it is the entrance to The Hawthorns from Carlton Road and the station's car park. 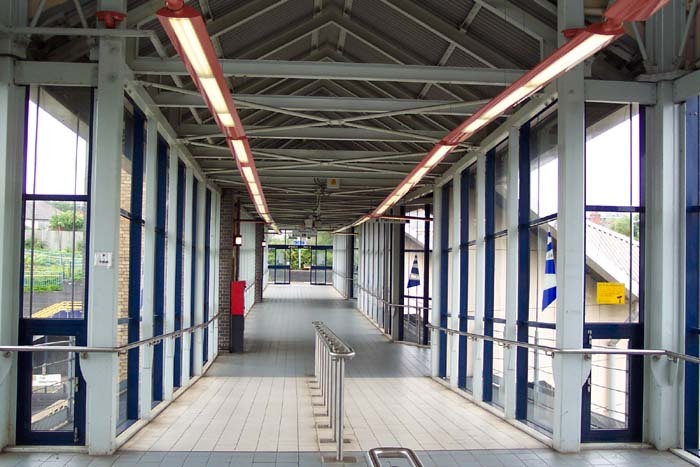 Above-left we have entered the inviting entrance and have turned to our left and are looking along the concourse down from which stairwells lead to both the heavy rail and Metro platforms. Above-right we are on platform 2 looking towards Birmingham as one DMU departs for Snow Hill and another arrives en route for Stourbridge Junction at platform 1. 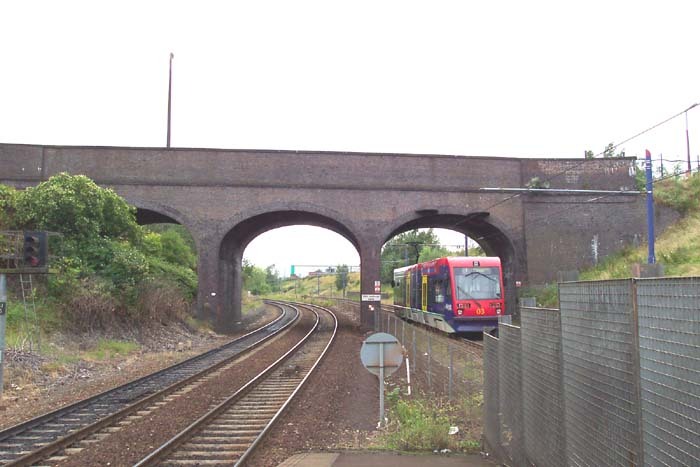 Above-left we are looking from platform 2 towards Halfords Lane bridge through the centre arch to the site once housing platforms 1 and 2 of the Hawthorns Halt. Above-right we are at the end of platform 2 looking back at the station building itself. 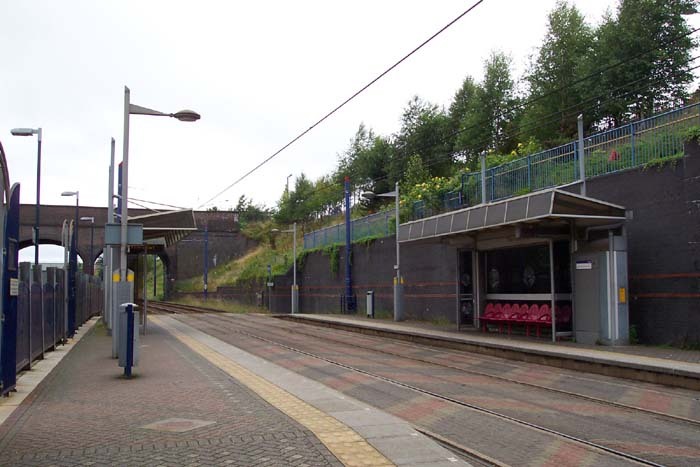 The design is reminiscent of all joint light/heavy rail stations on the route: Smethwick Galton bridge and The Jewellery Quarter. It is an impressive structure but the modern predilection for as much glass as possible doesn't make-up for the lack of quality stonemasonry used on its predecessors on this line. Above-left we are again on platform 2 looking through Halfords Lane bridge to the site once occupied by platforms 1 and 2 of the Hawthorns Halt that flanked the junction just ahead of this spot where the line bifurcates. 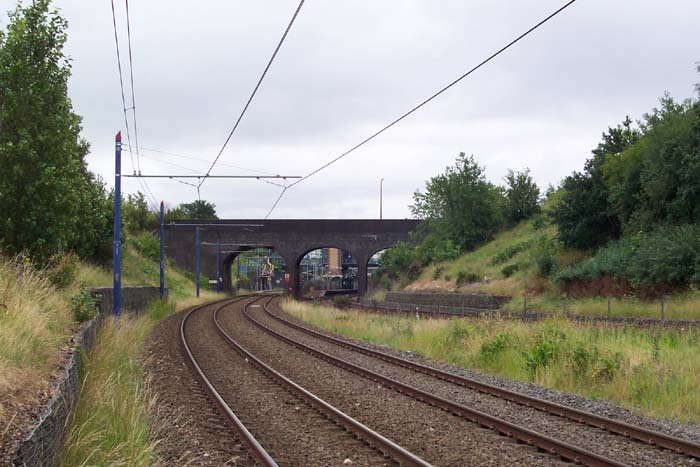 Interestingly, the right-hand embankment immediately beyond the bridge once housed a signal box that controlled the junction ahead and sidings at the Halt. Above-right we have now moved over to the Metro side of the site and are standing on the Wolverhampton platform again looking to Halfords Lane bridge. It is, as with all Metro stops, of a purely functional design and of little interest. Above-left we are in the same spot as for the previous shot but have turned 180 degrees to look back at the station concourse and to the left can see the exit stairwell from the Birmingham platform of the Metro stop. Interestingly, and not apparent from the photographs, are the conflicting warning signs around the Metro stop: 'do not cross the line . . . penalty fine' etc . . . coupled with 'look both ways before crossing the tracks' and a sign pointing to the exit across the line! Above-right is a shot dedicated to Andrew Smith of the other side of Halfords Lane from the present station/Metro stop looking back towards Birmingham. 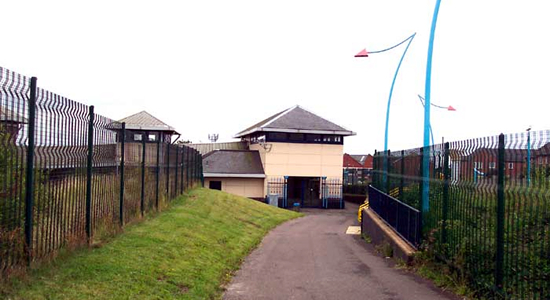 Both embankments housed the wooden platforms 1 and 2 of the halt. This part of the site is still easily accessible for those of you wishing to visit by following a pathway down from Halfords Lane on the Birmingham side of the tracks. Unfortunately, the entrance to the Wolverhampton side of this part of the halt is now blocked-off with vertically mounted sleepers at Halfords Lane bridge: quite fitting I suppose!